A septic tank can be defined as primary sedimentation tank with large detention time (12 to 36hrs against a period of 2hrs in an ordinary sedimentation tank). In un-sewered rural and urban areas septic tanks are suitable for disposal of night soil. But sufficient water should be available as water is required for flow of the night soil from latrine to the septic tank and for proper functioning of the septic tank. 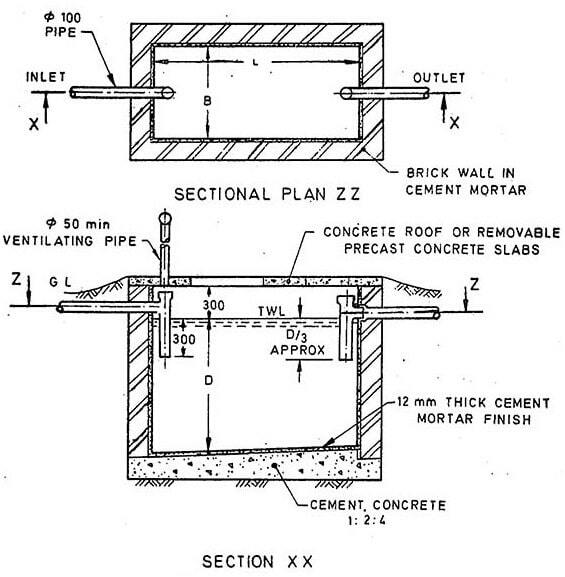 The size of the septic tank is so designed that the sewage is retained in the tank for 24hrs during which certain biological decomposition by the action of anaerobic bacteria takes place which liquefies and breaks the night soil leaving small quantity of soil which is known as sludge and settles at the bottom of the tank and clear water known as effluent flows out of the tank. 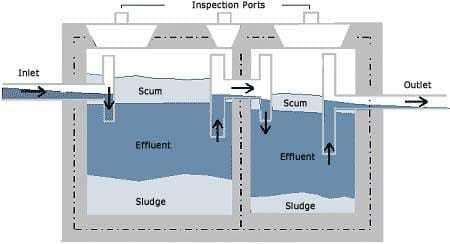 The effluent from the septic tank is usually disposed by absorption in the soil through soak pit, if no municipal drainage system is prevailing in the area. If municipal drainage line exists in the area, the effluent is discharged to the drain. It is to be noted that disinfection agent such as bleaching powder, phenyl etc. should not be used in cleaning latrines as disinfectant entering the septic tank kills the bacteria growth as a result of which rate of biological decomposition is retarded. Take liquid depth as 1.3meter. Suitable sizes of septic tanks for use of 5, 10,15,20,50 persons are given in following table.